Secretaries from several ministries, including Road Transport and Highways & Shipping and Railways, called for changes in government policies to reduce logistics costs, calling it the biggest hurdle which was preventing the country from matching the trade success of other countries like China and the US. Participating in the first session of the India Integrated Transport and Logistics Summit, the secretaries called for increasing the use of waterways and railways to bring down logistics costs, which stands at 4 per cent of the country's GDP. Talking about the ongoing Sagarmala project, the secretaries said it will help to a great extent in promoting shipping for carrying freight, instead of relying on road and railways which costs more. "On the logistics side the major component is port-led development to bring down the logistics cost. Under the Sagarmala project we gave projects worth Rs 1 lakh crore, hoping that 3,000 tonnes of capacity of ports will be achieved," said Rajive Kumar, Shipping Secretary. The three-day summit which ends on May 5, will see different agencies, both public and private, pushing for multimodal infrastructure in the country through close coordination between different agencies involved in planning and developing transport infrastructure. According to the government, India spends 13 per cent of its trade cost in logistics while foreign countries spend only 6-8 per cent. A.K. Mittal, Chairman of Railway Board, said if India does not take initiatives to bring down logistics cost then by 2020 the costs would mount to 5 per cent of the GDP. "We need to look into the various reasons why India is lagging behind. Currently due to our poor planning we have 60 per cent railways freight traffic in 16 per cent of the areas," said Mittal. Rita Teotia, Secretary Department of Commerce, called for change in regulation of logistics policies. "Other countries have adopted friendly methods. In China the logistics is handled by the trade and commerce ministry while in Singapore, it is handled by private industries with support of the government," said Teotia. 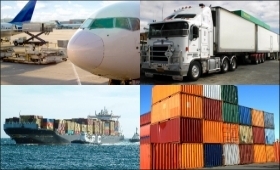 Stating that there is urgent need to improve logistics costs in India, the Ministry in a statement said that currently India has very poor Logistics Performance Index due to unfavourable modal mix of transport and a lack of seamless inter-modal connectivity . The IITLS is envisaged as a platform for all stakeholders in transport and logistics sectors to come together and initiate collaborative partnerships to realize the various greenfield and brownfield opportunities in logistic parks, freight corridors and IT solutions.